Plot– The plot of the novel is succinctly recounted in this text. The sprawling descriptions and laborious back-story to which Tolkien is partial is rarely indulged here, with focus on action and plot progression. There are many frames with no dialogue whatsoever, and the adaptors wisely kept historical exposition to what was necessary for understanding the plot. The pages of description Tolkien uses to retell the party’s encounter with trolls in the forests or Arnor come alive across 3 pages of action, allowing the reader to quickly comprehend the major actions of the plot without getting bogged down in sometimes unwanted detail. Setting- Again, setting requires the use of imagination in traditional prose texts. However, Wenzel does a great job illustrating the various locales in The Hobbit, using deep, dark greens and browns to accentuate the spooky forest of Mirkwood, and blue text boxes during Bilbo’s underground encounter with Gollum. The images of Rivendell, Hobbiton, and even the Lonely Mountain tell more than pages of description. Style- The style of the graphic novel favors Tolkien’s writing style, with emphasis on blocks omniscient narration and exposition. The panels are more stylized and still than the action comics of the Golden Age, and reflect movie stills more than adventure sequences. The highly saturated colors and watercolor-style, impressionistic illustrations add to the lack of gritty “realism,” reinforcing the fantasy elements of the story. Remember, The Hobbit was written much this way, without the moral and philosophical issues and hardships of the Lord of the Rings trilogy. So in this case, as many others, the graphic novel was written to model the style of the prose. Overall, this graphic novel adds something to the original book, as well as detracts. Although the setting and characters are lovingly portrayed, with added power due to the vivid illustrations, careful characterization is glossed to push forward the basic plot. And although that plot is very completely summarized in this text (a boon to those who struggle through Tolkien’s thick prose) underlying themes that emerge in the original pages are missed or quickly and explicitly stated, instead of shown through character’s thoughts or actions. Like other “Classics Illustrated”-type graphic novels, it makes for a successful introduction to the characters, setting, and plot, and has much value as a tool in that manner; however, no one should substitute this for the original, which contains the deeper themes and styles that really capture the work. 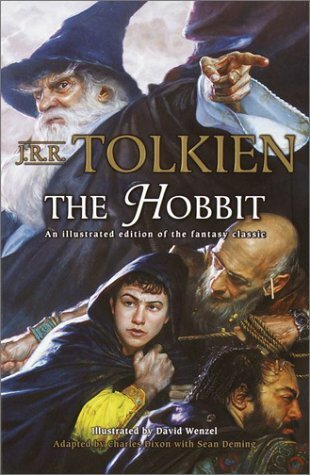 This entry was posted in Book Reviews and tagged graphic novels, The Hobbit, Tolkien. Bookmark the permalink.